Theater teaches children important values, such as commitment and dedication. Most importantly, theater teaches children how to grow into the adults that they want to become. It helps them learn to accept others as well. For these reasons, theater is essential for all schools. Being part of a play shows children that there are people who appreciate them. 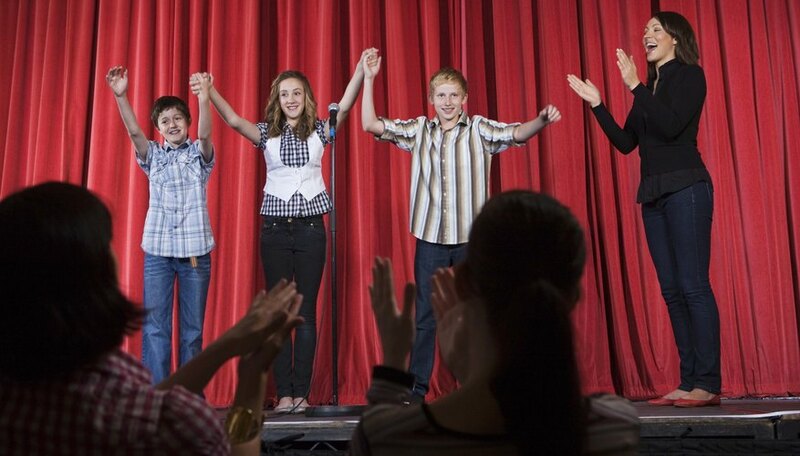 Theater helps build up self-esteem with each round of applause the performers receive. Public speaking can be a huge problem for someone too shy or someone who lacks confidence. Being part of the theater can help a child to move past her shyness and develop proper public speaking skills. Theater brings out a child's creativity in a way that no sport can. This newly discovered creativity can help improve a child's reading and math skills by teaching her to open up her mind. If a child is playing a math whiz, she may become more interested in math as part of her research and characterization. Being part of a theater program is a great way to teach a child about commitment. When a child is involved in the production of a play, he'll realize that there are many others who are depending on him. He has duties that must be fulfilled, or he will let his co-stars and co-workers down. Theater requires a lot of dedication. A child must learn his lines and memorize stage blocking. Dedication is an important skill that is always used in the real world. Children learn this the moment they participate in a play production.